Conor (post 16) during a numeracy session. Katie (post 16) during a visit to the Owl Sanctuary, Stonham Barns as part of her animal care course. 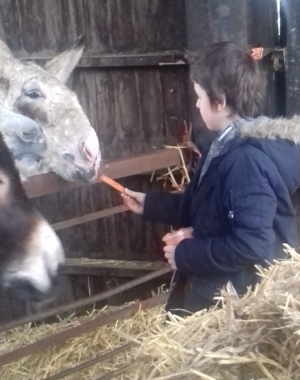 Nathan (year 6) at a Care Farm - part of his personal development programme. We deliver bespoke alternative education to young people aged 4 to 25 years old who are struggling to manage in a mainstream, PRU or special school/college placement. Given the breadth and range of our experience we work with a whole range of complex needs including (but not limited to) mainstream learning difficulties; social, emotional and mental health; and severe learning disabilities. Our office is situated in Martlesham Heath, Suffolk but our staff work all across East Anglia with a whole range of young people in 1:1, 2:1 and small groups sometimes incorporating delivery partners and supported work experience depending on the focus of the individual student’s programme. We take a holistic approach to all our education programmes balancing both a young person's personal and academic development. Most importantly, all Lapwing Education programmes are designed with the student’s needs, interests and aspirations at the forefront, maximising engagement and outcomes. When students are referred to us, there is sometimes some uncertainty about their specific needs and what the appropriate next education placement or pathway should be. We have developed a comprehensive initial assessment process with specific diagnostic assessments covering emotional, behavioural, developmental capabilities as well as literacy, numeracy, receptive language, dyslexia and dyscalculia. This means that we are able to develop the most appropriate programmes as well as advising families and funders on future provision. Lapwing take a holistic approach to education and all our students having personal and social development goals. Our programmes sometimes involve specific therapeutic interventions (for example integrative therapy, art therapy, neuro-linguistic programming, etc.) but almost all the work we do involves a therapeutic approach from our staff to enhance the young person’s personal, social and emotional development which is vital for them to be successful academically and in their personal lives. We use a number of tools such as the Thrive approach and Outcomes Star to develop individual action plans and measure student progress in terms of personal development.